This cool building is located in the Czech Republic, Prague. It is called the Nationale-Nederlanden building. 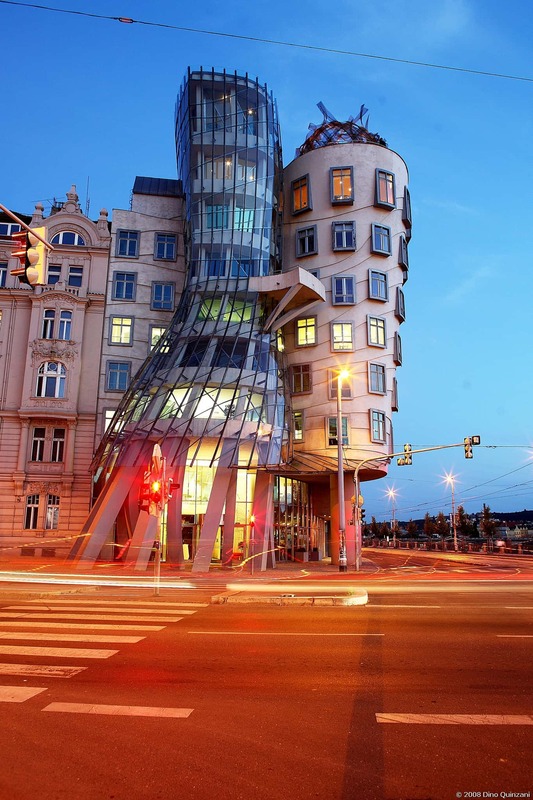 Locals have nicknamed the building The Dancing House or Fred and Ginger. Two architects worked on this project they were Vlado Milunić and Frank Gehry. Gehry originally named the building Fred and Ginger. He changed his mind later and decided that an American, Hollywood style name was not the best choice. The design was very controversial at first because may people believed it did not fit in well with the style of existing buildings. The concept of the Dancing House is a representation of Czechoslovakia's transformation. A transition from a communist regime to a political democracy. The building has two central bodies and the shape is supported by 99 concrete panels. Each one of the supporting panels is a different shape. The building is now featured on a Czech coin. It stands out from the surrounding buildings because of it's unusual, modern shape. Interestingly, it also blends in well enough to add uniqueness without destroying the appeal of the other buildings.